After the grueling, yet basking roundup, here I am back with a short story ...and a yummy Tofu Butter Masala! Long Long ago, a king wanted to test his subjects. He placed a huge boulder in the middle of the main road leading to his city. Then he hid himself and watched to see people's reactions. Some of the king's wealthiest merchants and courtiers came by and simply walked around it. None did anything about getting the big stone out of the way. Then a peasant came along, carrying a load of vegetable basket. On approaching the boulder, the peasant laid down his burden and tried to move the stone to the side of the road. After much pushing and straining, he finally succeeded. As the peasant picked up the vegetables, he noticed a purse lying in the road where the boulder was placed. A problem free life never makes a strong and good person. Have a tough but winning day ahead! Be strong enough to accept the challenges in life. Don't ask Life, 'Why Me? ', instead say 'Try Me!'...!!!! 1. In a bowl, whisk in all the ingredients listed for 'Masala Mix' and keep aside. 2. Heat some oil in a wok, saute onion and ginger garlic paste for couple of minutes. Add in the 'Masala Mix' mixture. Cover and cook for 5-6 minutes on low flame. 3. Finally add Tofu cubes and season with salt. Simmer for 7-8 minutes on meduim-low flame. Make sure the cubes are dipped into the sauce. 4. Serve hot with roti, naan or any flat bread! This looks so like Paneer Butter masala . Thats a great substitute Siri. Nice thinking (pat on the back). I loved the story although I have heard it many times. What was new - was the note. And thats so true isnt it! Knowing me u know that I always say - Nothing comes easy and if it does - BEWARE! hehehehe. Love the post. maaku manchi vindu bhojaname kaadu, manchi katha bhojanam kooda pedathaavu, Siri! I love both the story and of course the delicious tofu butter masala! 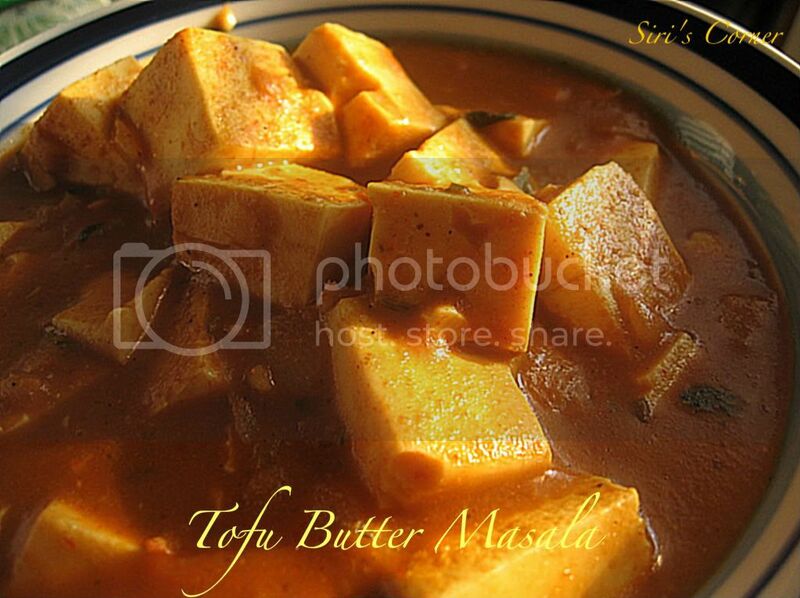 tofu butter masala looks delicious.good entry. yay yay..try me! !..hehehe...very nice to see you giving such stories before the recipe..atleast this way I get to read some stories...:))..
Wow it looks super delicious. oh a wonderful alternative to paneer. I like this very much! the dish looks yummy from the pics :) and a nice story to go along! They look yumm Siri..very similar in looks to the paneer butter masala..
Lovely story and lovely recipe Siri. 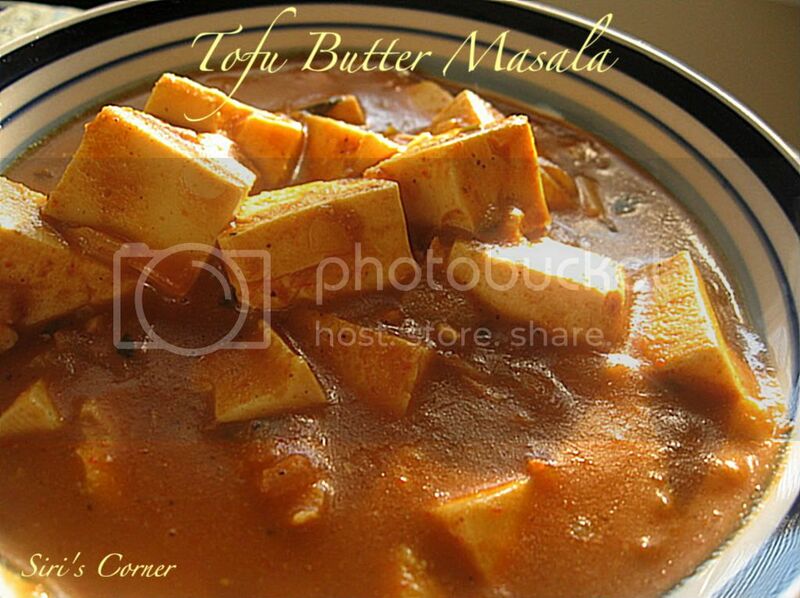 I've always wanted to try tofu butter masala. Will try it out and let you know.